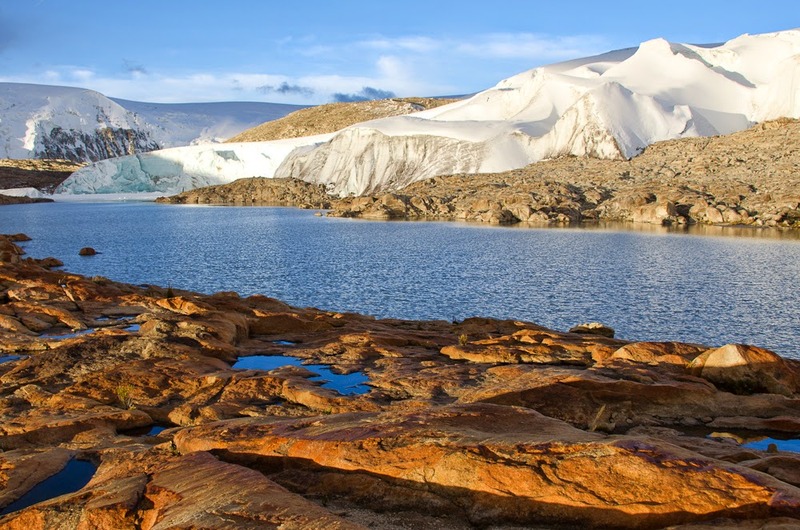 The dry season is an ideal time for fieldwork on Quelccaya Ice Cap, when humidity is low, the atmosphere is stable, and intense solar radiation compensates for annual air temperature minima. 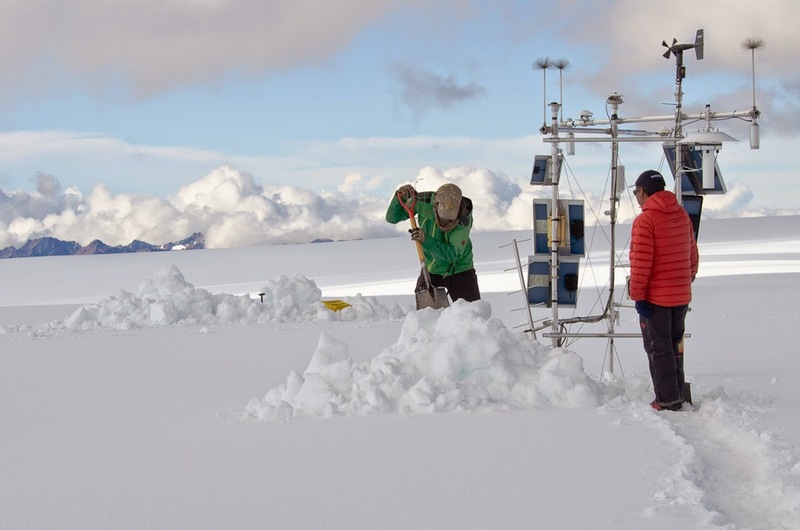 Since installing the summit AWS, this is the time of year when we have serviced the station and made snowpit measurements (i.e., June or July). Although weather during our fieldwork has varied considerably from year to year, visiting exclusively during the dry season has provided an incomplete - even biased - perspective on Quelccaya climate. AWS measurements, of course, demonstrate all the seasonal cycles and patterns, yet cannot substitute for the subjective impressions one gains by actually observing and experiencing weather; both are essential in advancing the understanding of a location's climate. Recent fieldwork has provided a new perspective on seasonal variability, as a component of NSF-sponsored research with Mathias Vuille & John Hurley (University at Albany, SUNY) examining the South American Summer Monsoon. Our new study is combining onsite measurements, the high-resolution ice-core record, and isotope-enabled model simulations to reconstruct monsoon variations upstream over the Amazon basin for the past millennium. The images below provide an overview of our most-recent fieldwork, conducted during the transition from a particularly moist wet season to the 2014 dry season. After two days acclimatizing at ~4,900 meters elevation, we moved up to a camp near the ice cap margin at 5,200 m for a week. Three days were spent at the summit (5,680 m), collecting AWS measurements, servicing the station, measuring and sampling snow for stable isotope and black carbon analysis, and collecting air samples for stable isotope analysis of water vapor (deuterium). Assisting in every aspect of the effort were Felix Benjamín Vicencio and Koky Casteñeda, both among the most-experienced Peruvian mountain guides (AGMP-UIAGM). In a word, "moisture" was the most-different aspect of the Quelccaya environment in April compared to the dry season. Most obvious were more-numerous streams draining down into flooded, verdant bofedales (wetlands) which were alive with birds and insects, yet the difference in atmospheric humidity was so pronounced that it could be both felt and seen. During the day, visibility (transmissivity) was reduced, towering convection resulting from instability led to near-daily snowfall (esp. graupel), and intervals of solar radiation provided welcome warmth. At night, higher humidity and cloud cover kept the net longwave radiation balance much higher, with notably higher overnight air temperature than during the dry season. 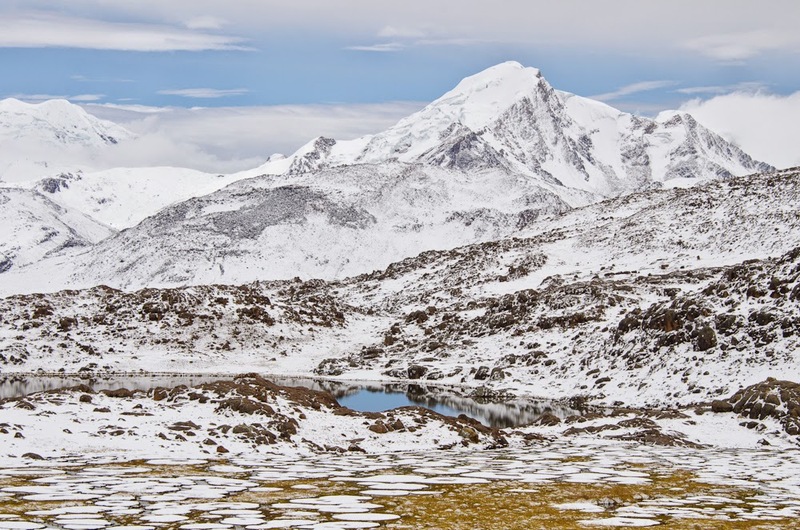 Relative to mid-latitudes, the seasonal air temperature difference at Quelccaya is minor (1-2° C range in mean monthly values), yet at these high-elevations close to the freezing point, the biotic impact appears to be amplified. For example, we observed that the breeding season was underway for many resident bird species during this transitional time. We previously speculated that this might be the case (see here for link to paper) and on this trip we documented breeding by several species. 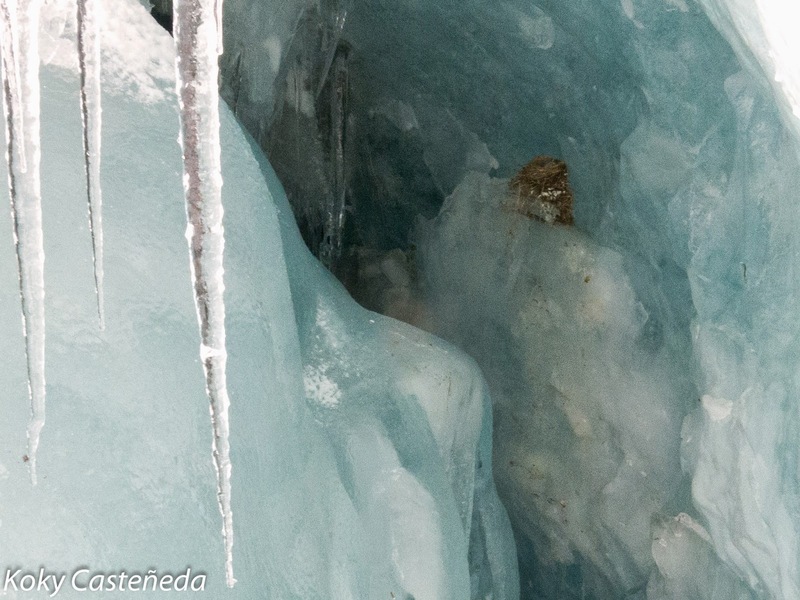 Among our most-exciting discoveries in this realm was the first-ever documentation of an active Diuca speculifera nest, the only bird species known to successfully nest on glaciers (see photo below). 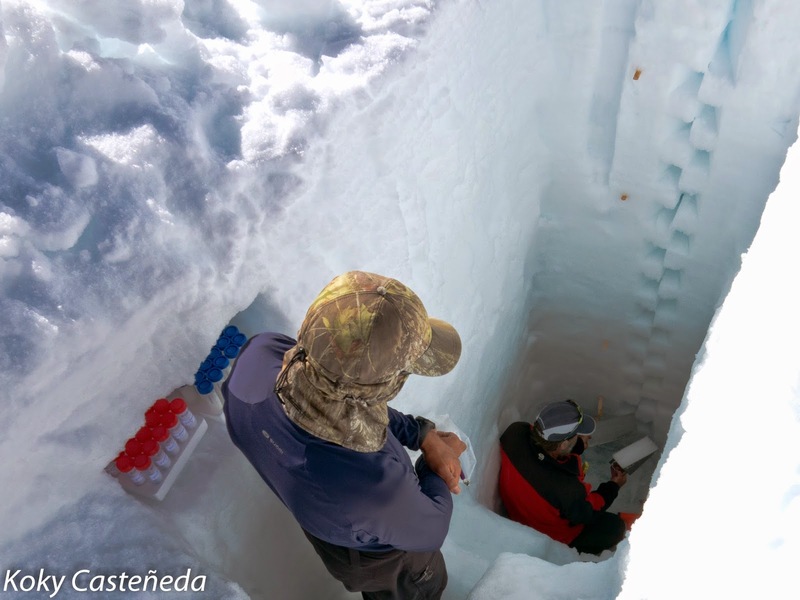 Other results from Quelccaya fieldwork in April will emerge in the months ahead. However, our initial measurements and observations raise concerns about the continually increasing atmospheric freezing level, as well as future changes in monsoon characteristics - both associated with enhanced greenhouse gas concentrations. Figure 1 (above). Snow-covered landscape of the Cordillera Vilcanota at ~5100 m, slightly below our camp. Note lake, and bofedale in foreground. Figure 2 (above). 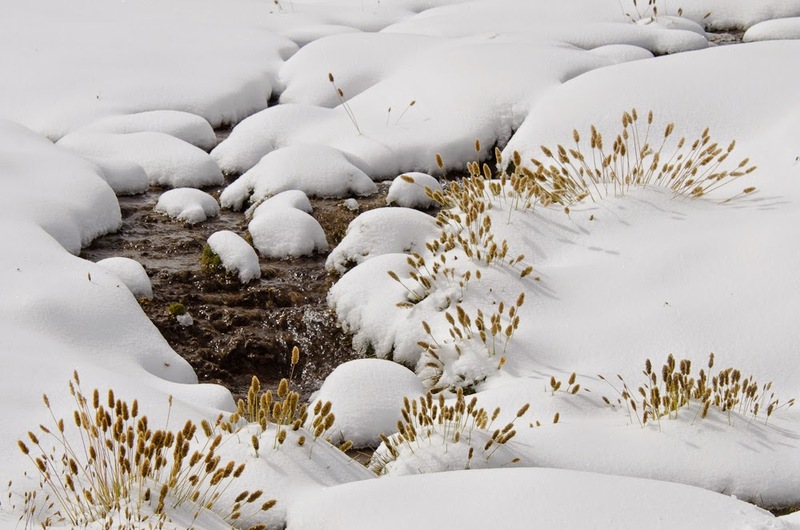 Fresh snow and a small stream in the area around camp at 5200 m, burying all but seed heads of the grass Calamagrostis chrysanth. Figure 3 (above). 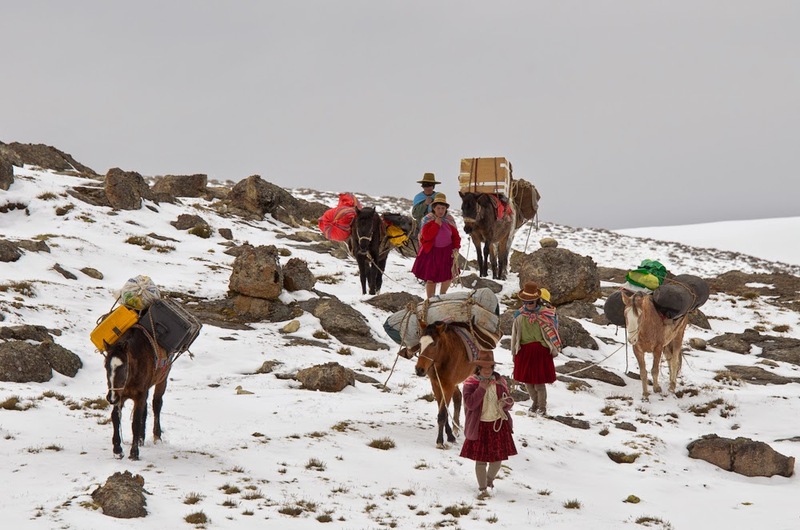 Horses and the Condori family helping to transport equipment down from the glacier (visible in background). In these difficult conditions, we were humbled by their mental and physical toughness, ascending to our camp at dawn - during a snowstorm - wearing rudimentary open-toed sandals. One of the women is carrying her one-year-old (yellow hat) in addition to an even-larger bundle of other items. Figure 4 (above). Quelccaya AWS after ~3 m of snow accumulation during the 2013-14 wet season, with our snowpit in background. Note convection to the northeast over Amazonia. Figure 5 (above). Snow accumulation for 2013-14 amounted to 2.92 m on 28 April, with 5-10 cm additional early on the 30th. A continuous, 10-cm interval density profile was measured with a 1000 cm^3 Snowmetrics cutter (shown), and 2 sets of snow samples (50 mL tubes at left) were collected and kept frozen during transport. Figure 6 (above). One of two active bird nests discovered during fieldwork, the first conclusive evidence of nest building on a glacier by Diuca speculifera (White-winged diuca-finch). Two nestlings were present in this nest, which was completely protected from precipitation and longwave energy loss. Within a crevasse 6-8 m above the ground and accessible only with modern ice-climbing equipment, it was also safe from predators. Figure 7 (above). Evening light on polished bedrock (ignimbrite) at the margin of Quelccaya Ice Cap, 5300 m.